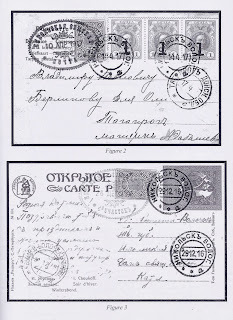 In recent years, Forgers have spent many many hours going through boxes of cheap Russian postcards circa 1900 – 1917 looking for ones which could be “improved” by the addition of Zemstvo stamps – or even Zemstvo stamps combined with new Imperial stamps applied to replace the ones which unthinking collectors had removed in the distant past. Some of these forgeries are childish but still fool collectors and the editors of serious philatelic journals: look at those below, two of many promoted to the pages of specialist Journals by the late George Werbizky. They hardly need comment. If you can’t see that they are Forgeries, you shouldn’t be collecting Zemstvos. 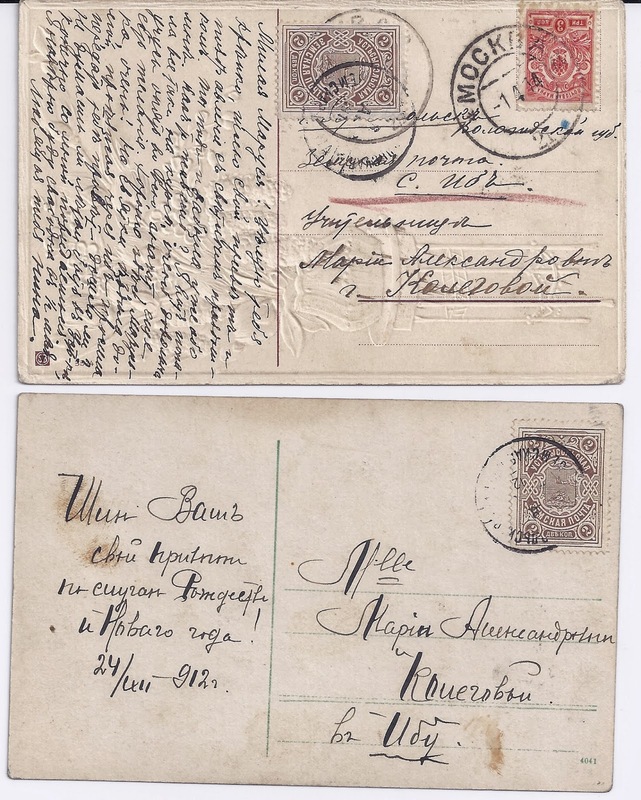 The first card – a typical Easter greetings card - was posted in Moscow and cancelled there on 1 4 14 with one strike on the stamp (paying the correct Tariff) and a standard second strike to the left. In any of the world’s flea markets it would cost very little. The Ustsysolsk Zemstvo stamp adds a lot of value, even though the basic stamp here is a common one. It has a cancellation which appears to be one employed in Ustsysolsk Zemstvo, but weakly struck. A perfect strike can be seen on a cover in the Faberge sale (Lot 2548) where it can be seen to read USTSYSOLSKAYAR ZEMSKAYAR POCHTA. But on this card, and unlike the two Moscow cancels, it does not come through as a raised impression on the front of the card. So could it be a fake? 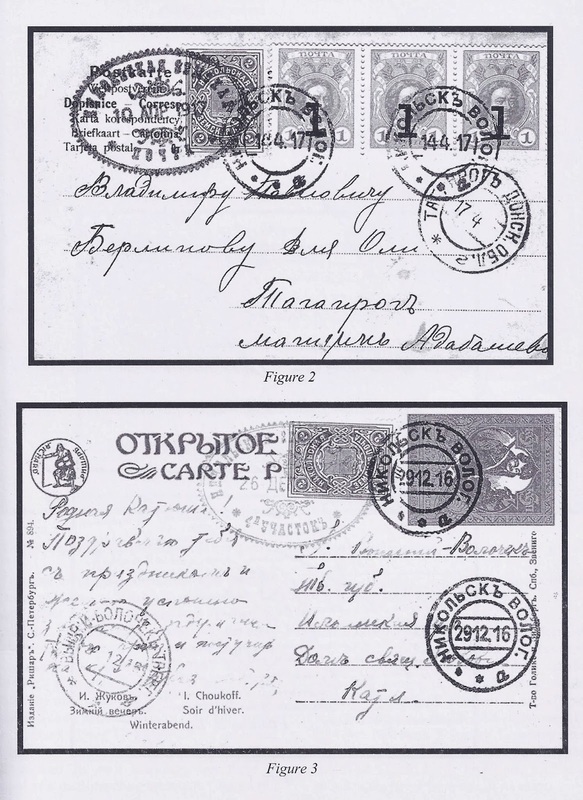 In the first line, partly obscured by the Zemstvo stamp you can work out that the card is addressed to Ustsysolsk in Vologda guberniya. That is the kind of address Forgers love to find. 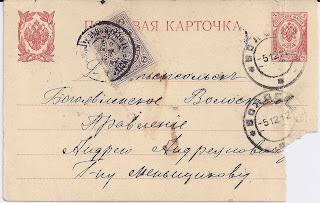 But what comes next in the second line is what decides the question: the sender has written the words “Zemstvo Post” and further specified what seems to be an address in the Zemstvo which is underlined in red (probably by a Zemstvo postal official). Anyway, the address leaves me in no doubt that this is a genuine Imperial + Zemstvo combination card. It also helps me with another card, the third one illustrated above, apparently locally sent within the Zemstvo. This is a New Year greetings card dated 24 XII 1912. On the romantic front of the card is the name “Maria” surrounded by flowers and the card is being sent to a woman called Maria. In fact, it’s the same Maria at the same address as on the previous card. So I reckon that if the previous card is an entirely genuine item so is this card. 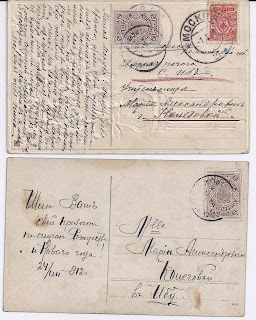 In conclusion, here is a third card sent to Ustsysolsk from Vologda in 1912. 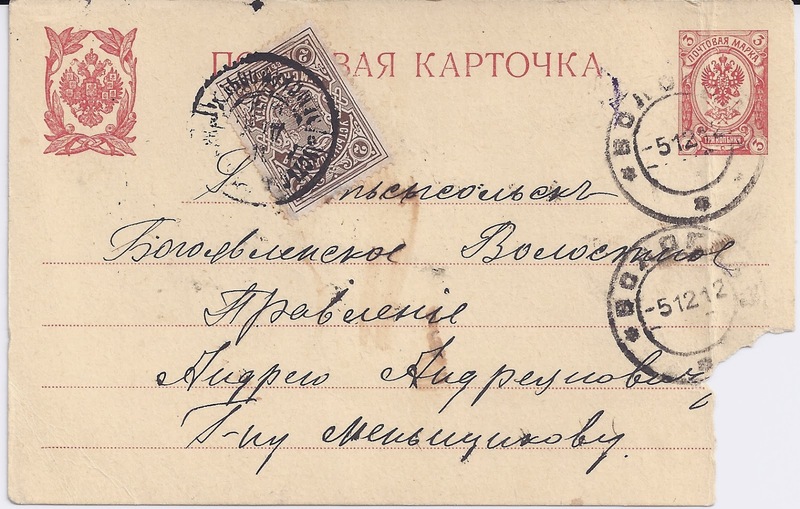 Same stamp, same Zemstvo Post cancellation, and genuine. And the condition is much more like that you should expect than that of the Forgeries which George Werbizky liked to show.